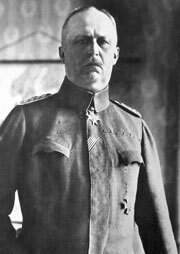 A leading general of the war, Ludendorff worked closely with to fashion some of Germany's greatest military successes.Ludendorff, quartermaster general in von Bulow's Second Army in 1914, helped to capture Belgian forts in the Liège area before being sent east to assist in Hindenburg's defence of Prussia. There he helped to plan the victories of and the Masurian Lakes. When Hindenburg became chief of staff in August 1916, Ludendorff followed him as first quartermaster general, forming the .Hindenburg and Ludendorff, plus leading industrialists and senior army officers, ran Germany as a military dictatorship during the last two years of the war. When Bulgaria sought an armistice on 28 September 1918 and the Allies broke through the on the following day, the generals realised that Germany would lose the war. As a result, they returned power to the civilian politicians.Moving to Sweden after the war, Ludendorff wrote a number of books praising the resilience of the German army. He returned to Germany to take part in the Kapp Putsch and Hitler's failed Beer Hall Putsch, and represented the Nazis in the Reichstag between 1924 and 1928. Hitler attended his funeral in 1937.A gifted general, questions persist over Ludendorff's temperament and lack of strategic vision. While he had an undoubted eye for battlefield tactics, some critics suggest that he was blind to the bigger strategic picture and this contributed to the ultimate failure of the 1918 Michael offensive. By July 1918, he had only had three days off in four years and when his beloved step-son was killed, he became morbidly attached to the boy's body, refusing to send it home. When Ludendorff learned that Bulgaria had initiated peace talks with the Allies on 28 September, he suffered a seizure.Hindenburg and Ludendorff can also be jointly blamed for failing to exploit the Russian Revolution more speedily by withdrawing all but a skeleton force from the Eastern front. The 1.5m troops stationed there continued to soak up vital resources, food and transport at a time when they could have been used more effectively in the west.